Aims: The purpose of the study is to determine whether the nickel released from the stainless steel brackets have any cytotoxic effects on gingival fibroblast. Materials and Methods: Brackets are an important component of fixed orthodontics. Orthodontists are mainly concerned about the brands and various systems incorporated into the brackets. The manufactures claim bracket superiority without valid research. Since we are dealing with a biologic system factors like biocompatibility, cytotoxic potential should be taken into consideration before selecting an appliance to the patient. The cytotoxic activity of the media was investigated with MTT and comet assay. Results: The results of the study show that the amount of nickel leached is capable of bringing damage to the fibroblast. Conclusion: Our study concludes that nickel solution at minimal concentration of 1.18 μg could damage human gingival fibroblast and the nickel released from the different brands of the brackets are not uniform. Aims: The aim of this study is to find out whether Oratest can be used as a diagnostic tool in assessing the caries activity by evaluating its relationship to the existing caries status and the salivary streptococcus mutans level. Materials and Methods: The study sample consists of 90 students divided into two groups. Group I (test group) and Group II (control group) consisting of 30 children for control group and 60 children for test group. The sampling of unstimulated saliva for the estimation of streptococcus mutans was done as per the method suggested by Kohler and Bratthall. The plates were then incubated. Rough surface colonies were identified as streptococcus mutans on a pre-determined area of the tip (approximately 1.5 cm 2 ) were counted for each side of spatula pressed against mitis salivarius bacitracin agar using digital colony counter. The results were expressed in colony forming units (CFU). Oratest was carried out in the same patients after the collection of salivary sample for the microbiological method to evaluate the relationship between the two tests. Statistical Analysis Used: The tests used were ANOVA, Pearson Chi-square test, Pearson's correlation analysis, Mann-Whitney U test and Student's independent t-test. Results: In the control group and test group, when the streptococcus mutans count (CFU) and Oratest time (minutes) were correlated using Pearson's correlation analysis, the streptococcus mutans counts was found to be in a statistically significant negative linear relationship with the Oratest time. When the caries status of the children, participated in the test group were correlated with mutans count (CFU) and Oratest time, caries status were found to be in a statistically significant positive linear relationship with streptococcus mutans count and in a significant negative linear relationship with Oratest time. Conclusions: The test proved to be a simple, inexpensive and rapid technique for assessing caries activity since a significant relationship exists clinically with caries status and microbiologically with the streptococcus mutans count of the individual. Aim: The aim of our study was to evaluate the advantages and disadvantages of 3D plating system in the treatment of mandibular fractures. Patients and Methods: 20 mandibular fractures in 18 patients at various anatomic locations and were treated by open reduction and internal fixation using 3D plates. All patients were followed at regular intervals of 4 th , 8 th and 12 th weeks respectively. Patients were assessed post-operatively for lingual splay and occlusal stability. The incidence of neurosensory deficit, infection, masticatory difficulty, non-union, malunion was also assessed. Results: A significant reduction in lingual splay (72.2%) and occlusal stability (72.2%) was seen. 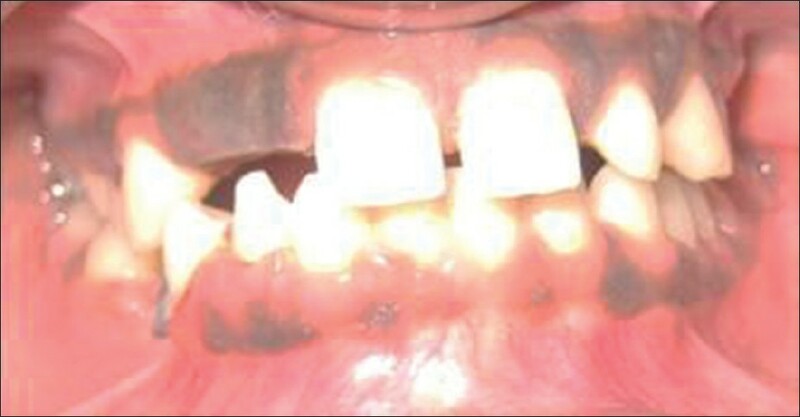 The overall complication rate was (16.6%) which included two patients who developed post-operative paresthesia of lip, three patients had infection and two cases of masticatory difficulty which later subsided by higher antibiotics and 4 weeks of MMF. No evidence of non-union, malunion was noted. Conclusion: A single 3D 2 mm miniplate with 2 mm × 8 mm screws is a reliable and an effective treatment modality for mandibular fracture. Introduction: A short clinical crown may lead to poor retention form thereby leading to improper tooth preparation. Surgical crown lengthening procedure is done to increase the clinical crown length without violating the biologic width. 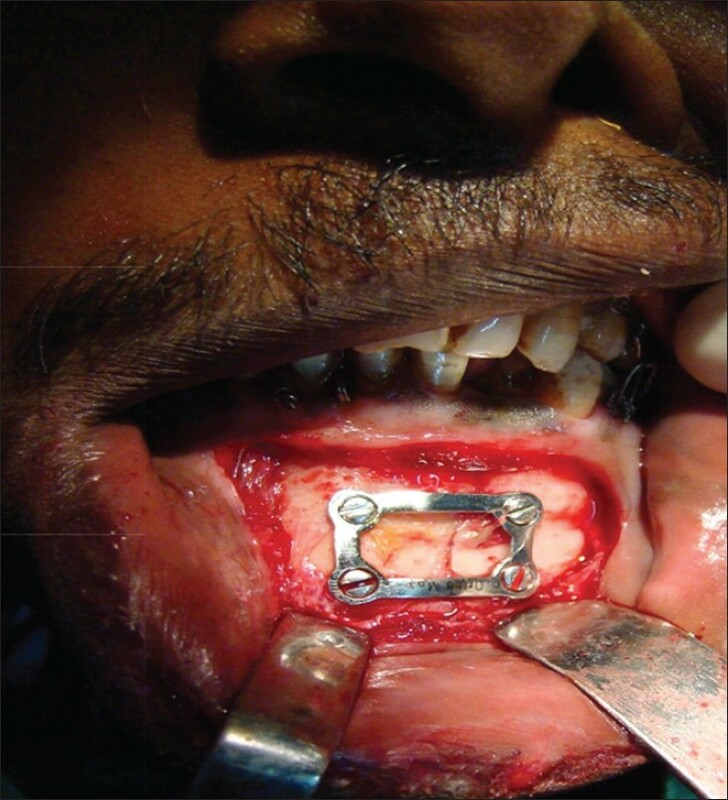 Several techniques have been proposed for clinical crown lengthening which includes gingivectomy, apically displaced flap with or without resective osseous surgery, and surgical extrusion using periotome. Objective: The aim of this paper is to compare clinically the three different surgical techniques of crown lengthening procedures. Materials and Methods: Fifteen patients who reported to the department of Periodontology, were included in the study. Patients were randomly divided into three groups, which include patients who underwent gingivectomy (Group A), apically repositioned flap (Group B) and surgical extrusion using periotome (Group C). Clinical measurements such as clinical crown length, gingival zenith, interdental papilla height were taken at baseline and at 3 rd month post-operatively. Results: Clinical and radiographic evaluation at 3 rd month suggest that surgical extrusion technique offers several advantages over the other conventional surgical techniques such as preservation of the interproximal papilla, gingival margin position and no marginal bone loss. 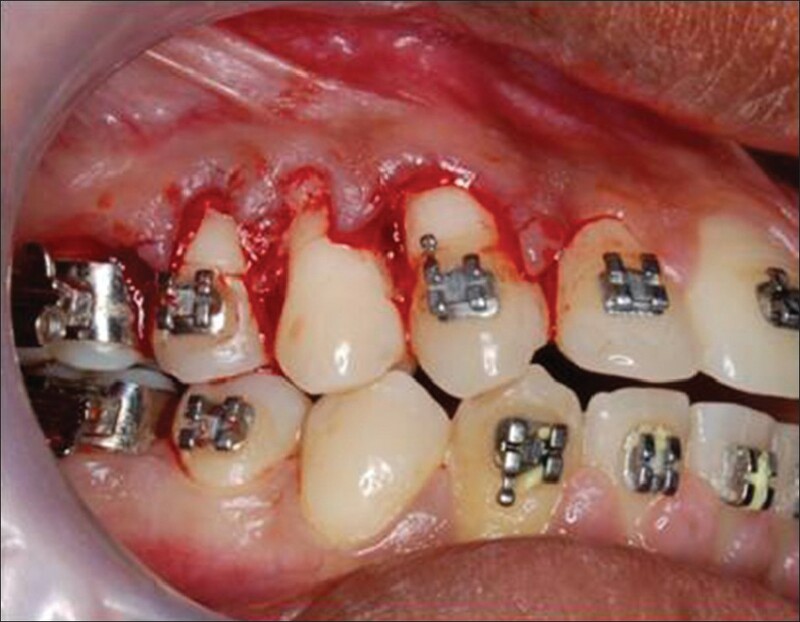 Conclusions: This technique can be used to successfully treat a grossly damaged crown structure as a result of tooth fracture, dental caries and iatrogenic factors especially in the anterior region, where esthetics is of great concern. Aim: To determine the reversal effect of 10% sodium ascorbate, on the bond strength of previously bleached teeth with hydrogen peroxide. 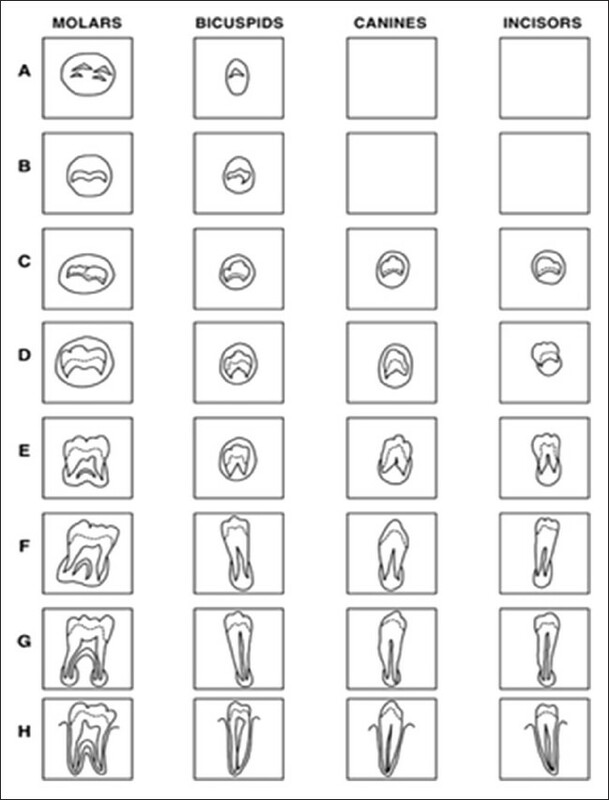 Materials and Methods: Sixty extracted maxillary premolars were selected and they were divided randomly into three groups. Group A teeth were etched and bonded; Group B bleached, etched and immediately bonded; Group C was subjected to bleaching, followed by treatment with 10% sodium ascorbate solution, then etched and bonded; Then all the three groups were subjected to testing procedure for bond strength. Results: The bond strength analysis was carried out by using instron, universal testing machine. In this study Group A had the maximum bond strength of 12.24 Mpa followed by Group C 11.62 Mpa and Group B 10.96 Mpa. Conclusion: Group C the experimental group which was treated with 10% sodium ascorbate following bleaching with 35% hydrogen peroxide provided higher bond strength compared to Group B which was bonded immediately after bleaching even though it was not statistically significant. Aim: The present study is undertaken primarily to determine if a correlation in the appearance of nutrient canals with hypertension and diabetes exists and to determine whether the presence of nutrient canals can be used as a clue for the detection of hypertensive and diabetic patients. Patients and Methods: A total of 300 subjects were selected from the out-patient department comprising of 100 diabetic patients, 100 hypertensive patients and 100 patients without any systemic diseases as control group. Intraoral periapical radiograph of all these patients were taken for evaluation. Statistical Analysis Used: Statistical analysis of the data was done using the statistical package for the social sciences (SPSS 15.0) using Chi-square analysis. Differences were considered as significant when P ≤ 0.05. Results: Of all these 300 patients, 162 patients exhibited nutrient canals whereas 118 patients didn't have nutrient canals. Of the 100 patients in Group I, 62 patients exhibited nutrient canals which accounts to 62% prevalence, 64 out of 100 patients in Group II, exhibited nutrient canals which account to 64% prevalence and 72 out of 100 patients in control group exhibited nutrient canals which account to 36% prevalence. Conclusion: As the study showed positive correlation, we conclude same that presence of nutrient canal can be used as an aid to rule out systemic diseases like diebeeis mellitus and hypertension. Aim: The aim of the study is to assess the impact of oral health related quality of life (QOL) on patients presenting for scaling and oral prophylaxis using a the oral health-related quality of life (OHRQL) questionnaire. Materials and Methods: This prospective study includes a total of 100 male patients of age group 25-35 years, who visited private clinic in Namakkal district, South India. They were assessed for their perceptions of oral health using OHRQL questionnaire before initial periodontal therapy including scaling and root planning. Results: A total of 100 patients (mean age:29 years) participated in the study and completed initial periodontal therapy. Before treatment 98% of the patients perceived that their oral health status impacted on their QOL in one or more ways. Bad breath was the most common complaint. Social well-being, personality and psychological function were identified as compromised OHRQL domains. More than 60% of the patients stated their overall general health is affected by periodontal disease. Conclusion: Periodontitis negatively affected QOL in this Namakkal district population of young male patients with mild periodontitis. Conventional non-surgical periodontal therapy and personality development counseling has a potential to ameliorate patient perceptions of oral health and improve their QOL. Aim: The aim of this retrospective study is to describe the incidence, aetiology, complexity and surgical indications of maxillofacial injuries in children and adolescents population of Tamil Nadu state of india during period of 4 years. Materials and Methods: A retrospective review was conducted among 500 children and adolescents patients of age group 6 years to 16 years suffered or suffering with maxillofacial and skull fractures presenting to ten Level I trauma centers over a 4 year period.The data collected for this study included age, gender, etiology, associated maxillofacial trauma, anatomic site of fracture and treatment. Results and Conclusion: In our study the most common cause of trauma was traffic 35%, followed by falls 24% and sports 22%. Mandible was commenest bone prone to fracture, followed by maxilla and nasal bone. Mandible fractures accounted for 72% of all maxillofacial fractures. Introduction: Career choice is a complex decision for students since it determines the kind of profession that they intend to pursue in life. As students try to make a career choice while in secondary school, they face the problem of matching their career choices with their abilities and school performance. Aims: The purpose of this study was to examine factors influencing career choice among dental college students in private dental collages in Tamil Nadu, India. Settings and Design: The study was conducted using descriptive survey design with a population of 989 students. The data for this study was collected using a questionnaire and interview schedules. Materials and Methods: The data for this study was collected using questionnaire previously used by Swati Shah and Rajaraman and interview schedules. The analysis of the study was based on the factors: Outcome expectations, gender, personal interests, and other factors. 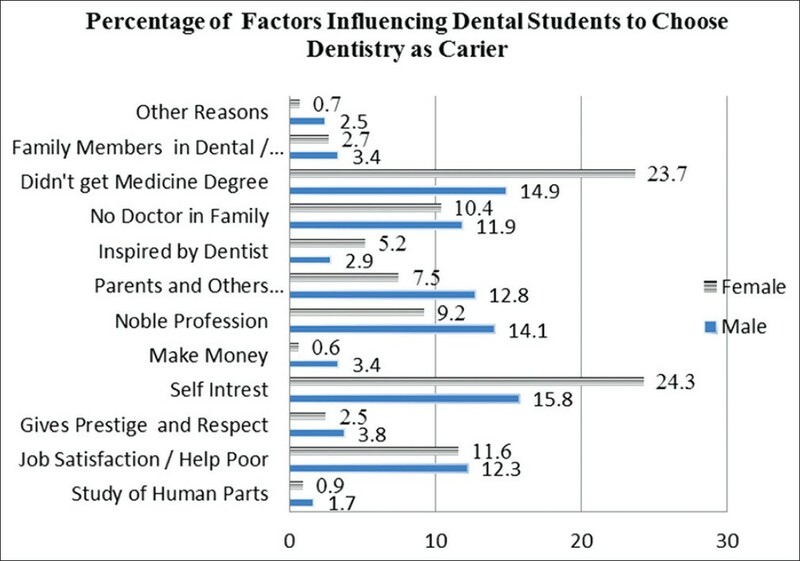 Results and Conclusion: The most common reason for among the dental students to choose dental science as their career choice was self-interested followed by didn't get medicine degree, prestige and gives respect. The least common reasons observed in the study population were inspired by dentists. The findings of this study indicate that availability the most influential factors affecting career choices among students. Introduction: Orthodontic treatment is based on the principle that if prolonged pressure is applied to the tooth, tooth movement will occur as the bone around the tooth re-models. In this study osteotomy of buccal alveolar plate and undermining of interseptal bone was performed at premolar extraction site and rate of en-masse retraction and canine retraction was evaluated. Materials and Methods: Patients between the age of 18 and 25 years, requiring retraction of anterior teeth are selected for the study. Osteotomy with undermining of interseptal bone at the extraction site was performed. The procedure was performed on all four quadrants. Results: The average retraction in the maxillary arch was 0.98 mm/quadrant in 3 weeks, i.e., a total retraction of 5.89 mm in a span of 9 weeks. The average retraction in the mandibular arch was 0.96 mm/quadrant in 3 weeks, i.e., a total retraction of 5.75 mm in a span of 9 weeks. Conclusion: This method of achieving faster en masse retraction immediately after extraction definitely reduced the initial retraction time. We recommend that such procedure must be carried out with appropriate anchorage conservation methods. Introduction: "The fibers running anteroposteriorly within the core and in concentric curves across the base of each rugae" determine their orientation and forms. The varying shapes of palatal rugae can be attributed to the fact that rugae develop as localized regions of epithelial proliferation and thickening. Fibroblasts and collagen fibers then accumulate in the connective tissue beneath the thickened epithelium and assume distinct orientation. Aim: The aim of the present study was to assess the morphology, gender difference of rugae pattern in 5-15 year old children. 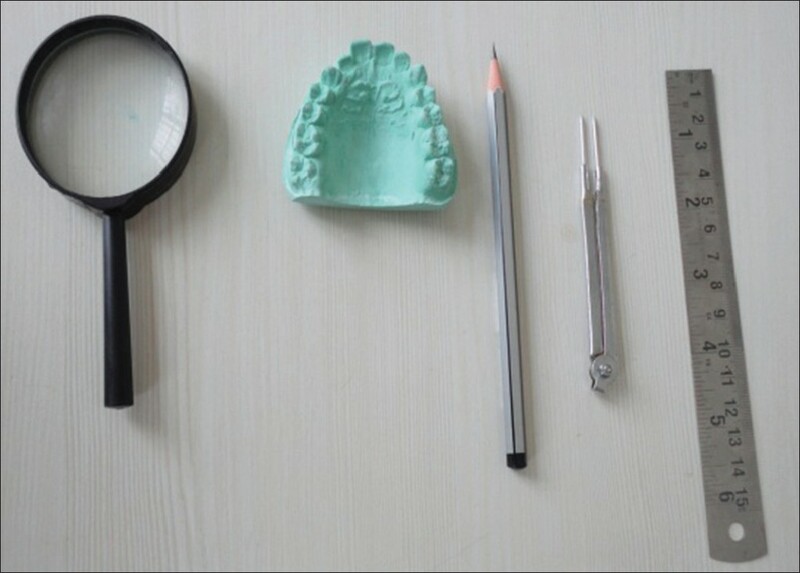 Materials and Methods: The various diagnostic dental stone cast available in Department of Pedodontics were analyzed by the method based on Thomas and Kotze classification in 1983. Results: There was a female prediction in the total count and primary rugae pattern. Comparing the shapes of rugae both in male and female study models showed a predominance in wave shape followed by cure. No circular pattern was observed in the study population. No statistical difference in the direction and unification of rugae among males and females. Conclusion: The fingerprint-like uniqueness of rugae to each individual has become accepted as a possible aid to person identification. This may help narrow the field for identification and give results in conjunction with the other methods such as visual, fingerprints, and dental characteristics in forensic sciences. Introduction: Within the last 20 years root demineralization has attracted attention as a periodontal regenerative technique. Topical tetracycline application has been widely reported for use as a conditioner, to decontaminate the root surface and to promote periodontal regeneration. The purpose of this scanning electron microscopic (SEM) study is to evaluate the surface characteristics of demineralized diseased and non-diseased dentine root surfaces using different concentrations of tetracycline hydrochloride (TTC-HCl). 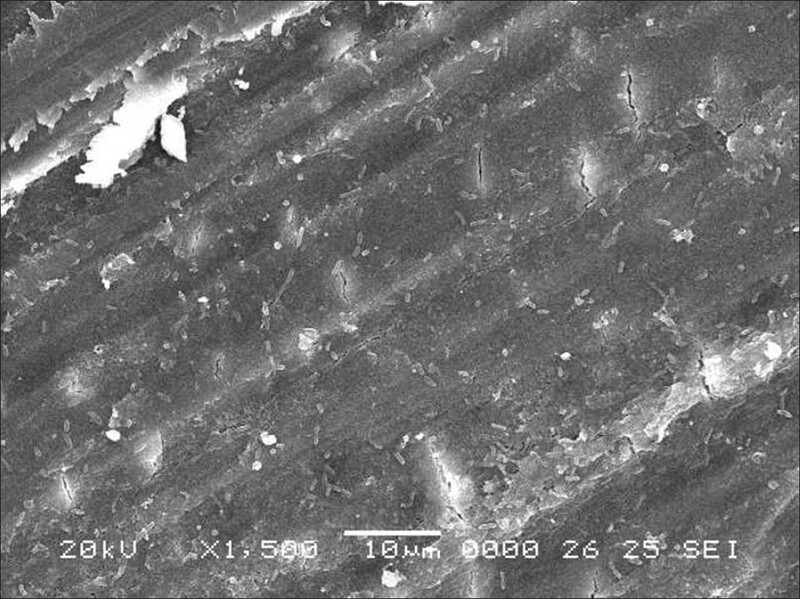 Material and Methods: This SEM study was carried out in 20 dentin samples obtained from non-diseased human premolars and 20 dentin samples obtained from diseased human premolars. Pure TTC-HCl was applied to the dentin surface at 50 mg/ml, 100 mg/ml and 150 mg/ml concentrations for 3 min in experimental groups while distilled (0 mg/ml) water was applied to the control groups. Statistical Analysis: Mean and standard deviation were estimated from the sample for each study group. Mean values were compared by either one-way ANOVA with Tukey-Honestly significant difference procedure or Kruskal - Wallis one way ANOVA with Mann-Whitney u-test. Further Student's independent t-test/Mann-Whitney u-test was used appropriately to compare the mean values between two independent groups. Results: In the present study using 100 mg/ml tetracycline seems to be more effective on both diseased and non-diseased dentin surfaces. Conclusions: The results of this study confirm that pure TTC-HCl conditioning produced comparable surface characteristics on dentin of both diseased and non-diseased roots with 100 mg/ml concentration for 3 min. Aim: To evaluate and compare the variations in the inclination of occlusal plane of casts mounted on Artex articulator using a facebow with a fixed value and customized nasion indicator. Materials and Methods: Twenty two subjects were selected for this investigation. Two maxillary impressions were made, and casts poured. For each of the twenty two subjects, the facebow records were made with, Artex face-bow using a fixed value nasion indicator and customized nasion indicator and mounted. 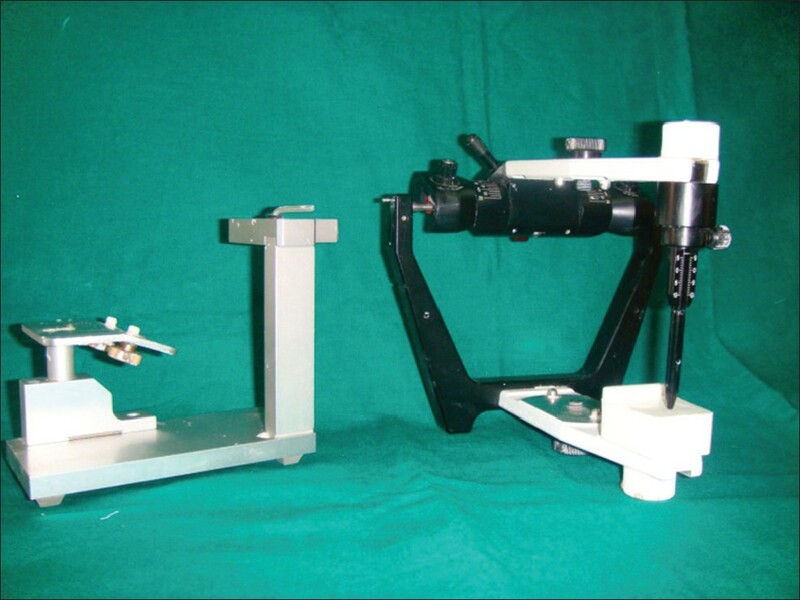 The angle between the occlusal plane of upper cast and the upper articulator arm was measured with a Universal bevel protractor and compared with the gold standard cephalometric value. 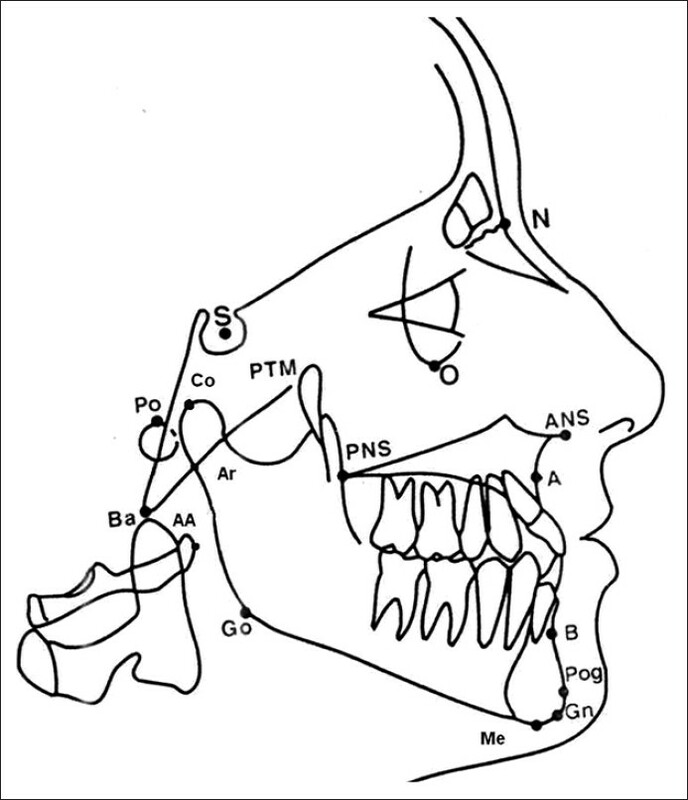 Results: It shows that, when angle was measured between maxillary occlusal plane and upper member of the articulator, on the mounted cast using a customized nasion indicator and fixed value nasion indicator against the gold standard cephalometric value as a whole, it was found to be not significant. But, if each patient were evaluated individually, there found to be the difference in the angle. Discussion and Conclusion: Variation in occlusal plane was very minimal and close to the cephalometric value when using customized nasion indicator compared to fixed value nasion indicator on the Artex. Introduction: Supernumerary teeth refers to an excessive number of teeth and are relatively common in the oral cavity. The supernumerary tooth located in the midline of the maxilla between the central incisors is referred to as "mesiodens." The present study emphasizes the importance of multidisciplinary management and long-term follow-up of patients with mesiodens. Aim of the Study: This study investigates the characteristics of mesiodens among children in patients reported to department of pediatric and preventive dentistry in an institution in the state of Tamil Nadu, India. Materials and Methods: The study population consisted of 55 children below 14 years. The characteristics of mesiodens were obtained from radiographs and clinical examination. And all these were confirmed as mesiodens by surgical intervention. Results: Results showed that males were affected approximately 2 times as frequently as females. Predominant shape of the mesiodens was conical (79.7%). 27 (49.09%) of 55 patients had multiple mesiodens. 25 (45.45%) of 55 patients required orthodontic correction after surgery. Conclusions: Mesiodens can cause many complications. So routine radiographic examination of all pediatric patients is advised. And when identified, they should be extracted as early as possible in children and adolescents in order to avoid possible complications. Introduction: Dental caries is a disease with multifactorial etiology. Early detection and preventive measures are essential for caries control. Caries activity tests are one of the methods of early detection, but all these are based on microbiological study. Aims: Compare the sensitivity and specificity of Snyder test (ST), lactobacillus count (LBC) and Cariostat in mixed dentition children with and without caries. Materials and Methods: 90 healthy mixed dentition children (79 boys and 11 girls) were selected and were divided into two groups, one with Decayed missing filled teeth (DMFT) 0 and another group with DMFT 3-5. The salivary samples were collected for ST and LBC and plaque samples were collected for Cariostat. Caries activity was assessed. Results: The data obtained were analyzed for sensitivity, specificity, positive predictive value, negative predictive value and over all accuracy. Conclusions: Our present study showed that the LBC was found to have a higher correlation in caries as the caries increased the count also increased with positive caries activity. A good correlation was found between Snyder and LBC for the caries activity 1, 2 and 3. But no correlation was seen for score 0. 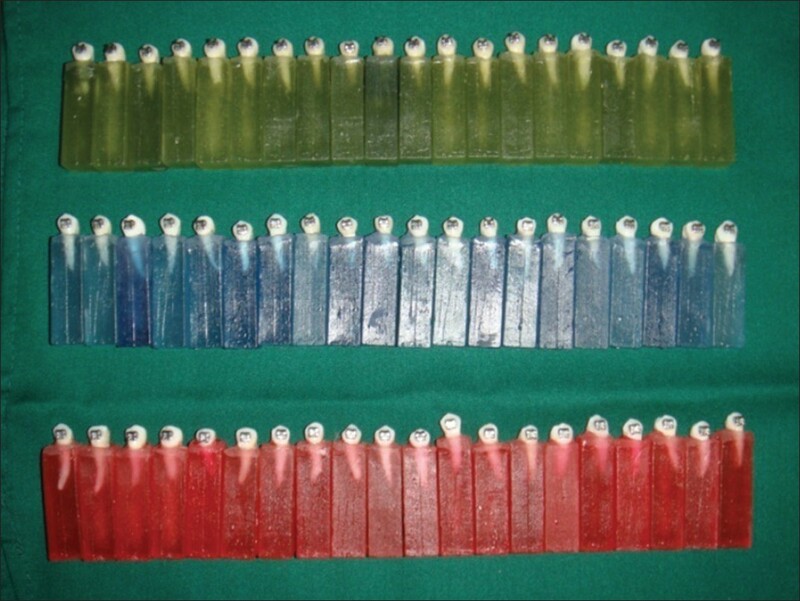 To conclude, a combination of all these tests was found to be good for assessing caries risk groups. Aim: The aim of the study is to compare two different methods: Enameloplasty sealant technique (EST) and conventional sealant technique (CST) in terms of the presence or loss of sealant and the presence or absence of caries after 6, 12, and 18 months. Materials and Methods: A total of 15 children in the age group of 7-9 years participated in the study. After taking consent, status of occlusal surface was evaluated under standardized conditions. Only mandibular molars were used in the study. On each patient, one side molar was sealed using EST and other side molar was sealed using CST. All children were recalled and examined after 6 months, 12 months and 18 months. Results: At the end of 18 months, no teeth were found carious in EST and CST group. At the end of 6, 12, 18 months there was no loss of sealants in both EST and CST group. There was no difference between EST and CST success rates. Conclusion: In our study both EST and CST showed good results. So we can do EST in deep I-Type and K-Type pit and fissures. Background and Objective: The knowledge of bone age and dental age is of great importance for pediatrician and pediatric dentist. It is essential for a pediatric dentist to formulate treatment plan and it is a source of complementary information for pediatrician. There are few studies, which showed the relationship between dental age, bone age and chronological age in underweight children. Therefore, objective of this study was to determine and compare dental age, bone age and chronological age in underweight children. Materials and Methods: 100 underweight children between the age group of 18-14 years were selected. Chronological age was assessed by recording date of birth. Dental age assessment was done using orthopantamogram following the method described by Demirjian. Bone age assessment was carried out using hand wrist radiograph following Bjork, Grave and Brown's method. Results: Dental age and Bone age was delayed compared to chronological age in both sexes. The correlation between chronological age, dental age and bone age were all positive in males. Interpretation and Conclusion: The data supports the concept that dental age and bone age delay is a significant feature in underweight children. It is important to consider dental age and bone age as variables for diagnosing underweight children. To support our findings further a well-designed, controlled as well as longitudinal studies with a larger sample size is required. Aim: The aim of our study is to compare the efficacy of ultra-violet light (U-V light) and direct current glow discharge in disinfecting Candida Albicans coated elastomeric impression material. Materials and Methods: Two hundred and forty samples of addition silicone material in the form of circular discs measuring (diameter-30 mm, thickness-3 mm) were prepared. Samples were divided into four groups namely A, B, C, D, with each group containing 60 samples. All samples in each group were sub grouped as follows for exposure time 15, 30, 60, 90, 120 and 180 s respectively. Group A samples were exposed to U-V light with 8 watts. Group B samples were exposed to U-V light with 16 watts. Group C samples were exposed to U-V light with 24 watts. Group D samples were exposed to direct current glow discharge. After exposure, the impression material was swabbed on sabourauds dextrose agar (SDA) plates and incubated at 37°C for 48 h. The total number of colonies indicating the number of C. Albicans that survived the direct current glow discharge and U-V light treatment was then determined using a microscope. Results and Conclusion: Group A samples exhibited proportionate decrease in the number of colonies with each greater time of exposure. Group B samples exhibited proportionate decrease in the number of colonies with each greater time of exposure. Group C samples exhibited total absence of C. Albicans colonies at 90 s exposure. In Group D samples there was a proportionate decrease in number of C. Albicans colonies with exposure to direct current glow discharge for more seconds. Hence, this study reveals that exposure to U-V light drastically reduced the C. Albicans colonies compared with exposure to direct current glow discharge. It was observed that with greater wattage of U-V light tube in U-V light unit chamber, greater decrease in colony count was observed in lesser time of exposure. Oral submucous fibrosis (OSF) is a chronic, progressive, potentially malignant condition affecting the oral cavity and frequently involving the upper part of the aerodigestive tract including the oropharynx and the upper part of the esophagus. It is characterized by juxtaepithelial inflammatory reaction and progressive fibrosis of lamina propria, leading to stiffening of the oral mucosa eventually causing trismus. This condition is associated with significant morbidity and high risk of malignancy. Over the years, several drugs and combinations have been tried for the treatment of submucous fibrosis, but with limited success, because of its unclear molecular pathogenesis. 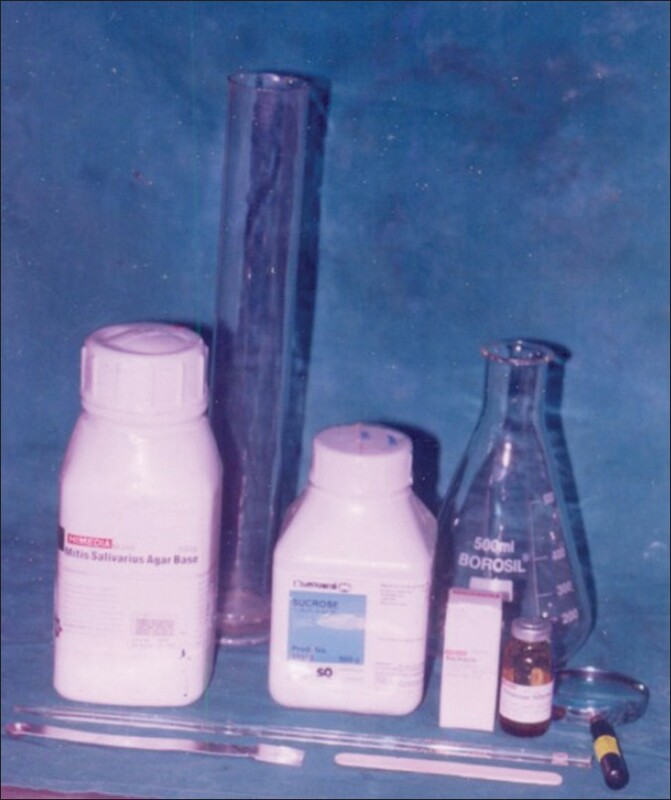 Till date, there are no known effective treatments for OSF. The aim of this article is to emphasize on the molecular changes taking place in OSF and possible therapeutic interventions. Gingivitis and periodontitis are most common inflammatory diseases of supporting tissues of teeth. Role of microbial etiology and host response in progression of gingival and periodontal diseases has been well established. Because of the beneficial biological effects of ozone, due to its antimicrobial and immunostimulating effect, it is well indicated in the treatment of gingival and periodontal diseases. 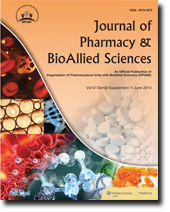 The objective of this article is to provide a general review about clinical applications of ozone in treatment of periodontal diseases and to summarize the available in vitro and in vivo studies in Periodontics in which ozone has been used. Identification plays a major role in any crime investigation. The pattern of wrinkles on the lips has individual characteristics like fingerprints. Cheiloscopy is a forensic investigation technique that deals with identification of humans based on lips traces. 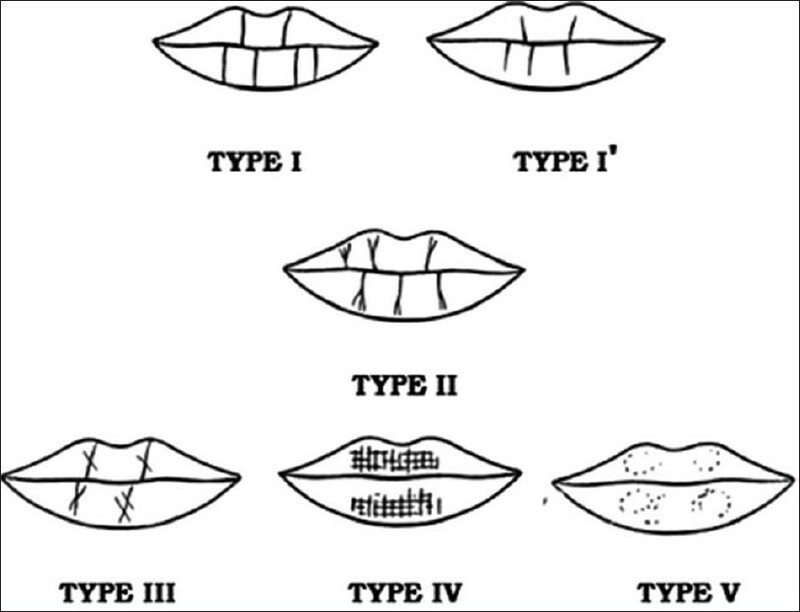 In the past decades, lip-print studies attracted the attention of many scientists as a new tool for human identification in both civil and criminal issues. 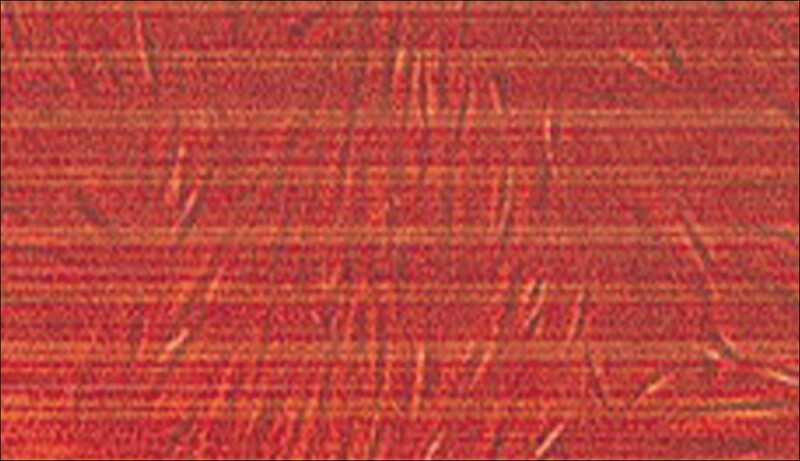 The lip crease pattern is on the vermilion border of the lip, which is quite mobile and lip prints may vary in appearance according to the pressure, direction and method used in making the print. It concludes by enlightening the readers with the fact that the possibilities to use the red part of lips to identify a human being are wider than it is commonly thought. Advent of osseointegration has rapidly led to use of dental implants over recent years. 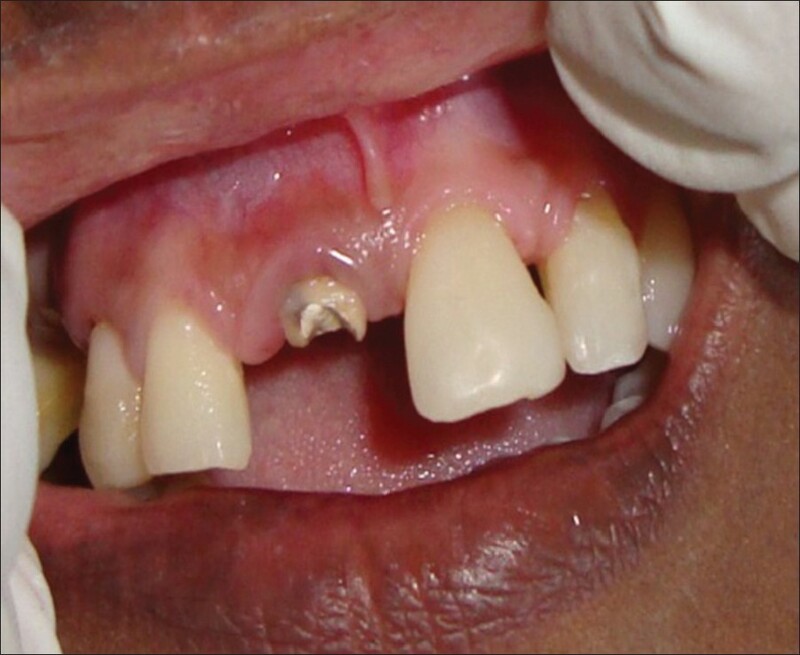 Implant complications are often inadvertent sequelae of improper diagnosis, treatment planning, surgical method, and placement. This can be overcome by using surgical guides for implant positioning. Although conventionally made surgical guide are used, the clinical outcome is often unpredictable, and even if the implants are well placed, the location and deviation of the implants may not meet the optimal prosthodontic requirements. High accuracy in planning and execution of surgical procedures is important in securing a high success rate without causing iatrogenic damage. This can be achieved by computed tomography, 3D implant planning software, image-guided template production techniques, and computer-aided surgery. This article evaluates about the various systems of conventionally made surgical guide using radiograph and also the newer computer generated surgical guide in detail. Clinical pulpal anesthesia is dependent on the interaction of three major factors. (1) the dentist (2) the patient and (3) local anesthesia. Many patients fear endodontic treatment due to a concern about pain. Although pain treatment is well managed in many endodontic patients, there exists a group of patients who do not receive adequate local anesthesia. The purpose of this review article is to discuss the possible reasons for pulpal anesthetic failures and also to focus on the measures for developing effective approaches for the same. The world of communication has changed greatly over the centuries of mankind from sounds, sign languages, speech, development of language and in modern times using machines like the computer, mobile and internet. Over the past five decades, the change in communication is remarkable. Similarly positive patient communication is always necessary to build confidence, increased rapport and cooperation and minimizes misunderstanding. Returning the patient in our fold promotes the patient for further preventive care and review and using them as a positive tool helps us in an ambassador of the growth of our health care unit. Our challenge is to provide the best environment for communication with a diverse population of interest, personalities and culture. Magnetic resonance imaging (MRI) has become a common and important life-saving diagnostic tool in recent times, for diseases of the head and neck region. Dentists should be aware of the interactions of various restorative dental materials and different technical factors put to use by an MRI scanning machine. Specific knowledge about these impacts, at the dentist level and at the level of the personnel at the MRI centers can save valuable time for the patient and prevent errors in MRI images. Artifacts from metal restorations are a major hindrance at such times, as they result in disappearance or distortion of the image and loss of important information. Dental Implants have become the standard care of rehabilitation of missing teeth. This article intends to review the success criteria for implants from 1979 till date. Earlier days implant success was evaluated by immobility and peri-implant radiolucency. But currently, the width of the attached gingiva, co-existing medical conditions, smoking, and width of the implant also play a role in evaluating implant success. Genetic and immunological markers have also been identified. Root-canal treatment can be carried out in single visit in vital, non-infected teeth, eliminating the need for dressing and provisionalization. 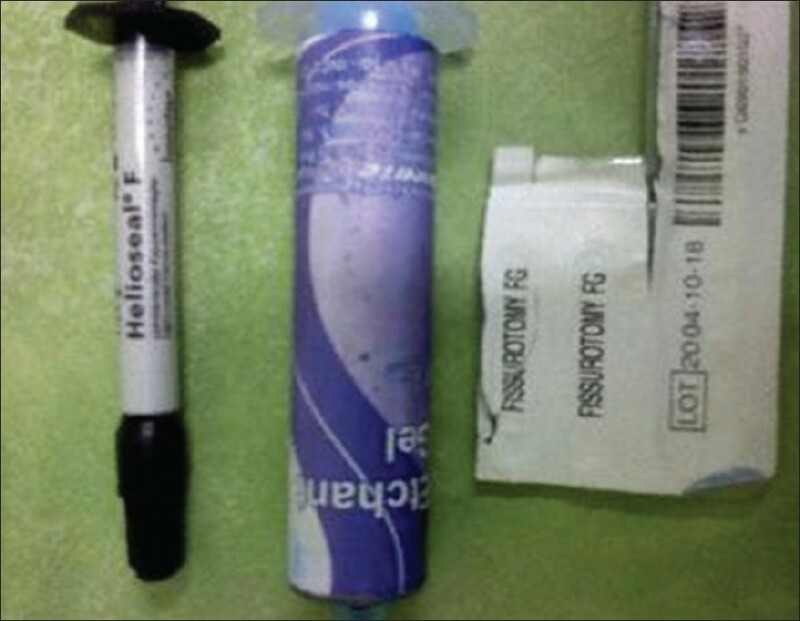 Many clinical cases with infected canals require dressing with antibacterial medicaments in a multivisit treatment in which effective provisionalization for different periods of time becomes mandatory. Successful root-canal treatment requires effective mechanical and chemical debridement, elimination of bacteria and pulp tissue remnants and proper canal shaping to facilitate effective obturation. Lack of satisfactory temporary restorations during endodontic therapy ranked second amongst the contributing factors in continuing pain after the commencement of treatment. This review aims to provide an overview of the materials used for provisionalization during and immediately after endodontic treatment. Bone grafts are used as a filler and scaffold to facilitate bone formation and promote wound healing. These grafts are bioresorbable and have no antigen-antibody reaction. These bone grafts act as a mineral reservoir which induces new bone formation. Ectodermal dysplasia represents a group of rare inherited conditions in which two or more ectodermally derived anatomical structures fail to develop. Early dental intervention can improve patient's appearance, thereby minimizing associated emotional and psychological problems in these patients. Treatment requires a teamwork by medical personnel along with dental professionals of various specialties. Here, a rare case of a young female patient is presented with prosthetic management with implant supported fixed partial denture.